Made from corrugated fiberboard, cardboard packaging is a paper-based material consisting of a fluted corrugated sheet and one or two flat linerboards. It is lightweight and extremely durable. 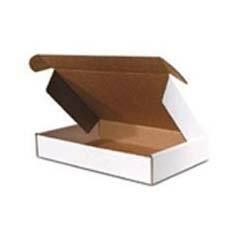 Corrugated boxes can serve as protection in shipping, as display, and as product packaging. The typical paper “sandwich” of material consists of an arched fluted center layer (called “the medium”) and one or two flat linerboard outer sheets (although this combination can vary with additional layers depending upon ultimate usage). You can vary the sandwich to contain natural brown kraft or mottled white outer layers. Traditionally corrugated is printed flexographic (rubber plates), for more complex jobs, printed litho sheets can also be laminated to the center fluting. Depending upon the end use, the size of the center fluting can vary – as well as the sandwich combination - larger fluting for outer shipping cartons – smaller or micro fluting for boxes containing lighter weight products. 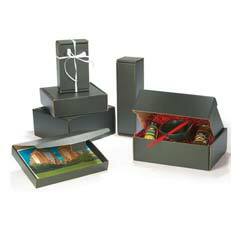 Corrugated material is great for both storage boxes and gift boxes and many other types of boxes in between. Single Face: One medium is glued to one flat sheet of linerboard. Single Wall: The medium is between two sheets of linerboard. Also known as Double Face. Double Wall: Threes sheets of linerboard with two mediums in between. Triple Wall: Four sheets of linerboard with three mediums in between. Architects have known for thousands of years that an arch with the proper curve is the strongest way to span a given space. The inventors of corrugated fiberboard applied this same principle to paper when they put arches in the corrugated medium. These arches are known as flutes and when anchored to the linerboard with a starch-based adhesive, they resist bending and pressure from all directions. Flutes come in several standard shapes or flute profiles (A, B, C, E, F, etc.). A-flute was the first to be developed and is the largest common flute profile. B-flute was next and is much smaller. C-flute followed and is between A and B in size. E-flute is smaller than B and F-flute is smaller yet. In addition to these five most common profiles, new flute profiles, both larger and smaller than those listed here, are being created for more specialized boards. Generally, larger flute profiles deliver greater vertical compression strength and cushioning. 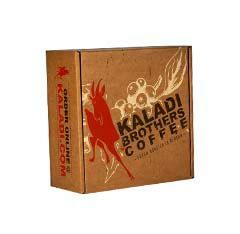 Smaller flute profiles provide enhanced structural and graphics capabilities for primary (retail) packaging. Different flute profiles can be combined in one piece of combined board. For instance, in a triple wall board, one layer of medium might be A-flute while the other two layers may be C-flute. Mixing flute profiles in this way allows designers to manipulate the compression strength, cushioning strength and total thickness of the combined board. The first known corrugated material was patented for sweatband lining in tall hats of Victorian Englishmen. Unlined corrugated first appeared as a packaging material for glass and kerosene lamp chimneys. A liner was added to one side of the corrugated material to prevent the flutes from stretching. Corrugated was slotted and cut to make the first boxes. Wells Fargo began using corrugated boxes for small freight shipments. Corrugated was first approved as a valid shipping material and was used to ship cereals. Rubber printing plates were developed which allowed for greater design creativity. Flexographic printing virtually replaced letterpress and oil-based ink. New developments in the anilox roll, plate and press design drove the industry into short-run, high-graphic products. Modern Arts offers a wide variety of stock inventory, ready to ship corrugated boxes - available for immediate purchase online. SHOPPING FOR LESS THAN 500 CORRUGATED BOXES? 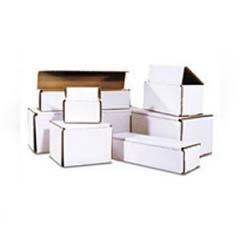 NEED BLANK CORRUGATED BOXES OR IN A RUSH? 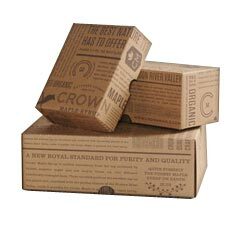 Plain Corrugated Boxes Ship Same or Next Business Day!